May is Skin Cancer Awareness month. 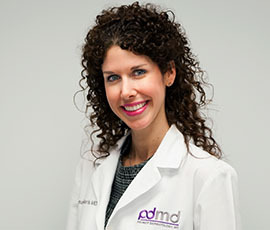 In partnership with the American Academy of Dermatology, Dr. Bilu Martin was happy to perform free skin cancer screenings at Premier Dermatology, MD. But we believe that every month should be Skin Cancer Awareness month. Protecting yourself from the harmful rays of the sun should be a daily goal. Wearing sunscreen and reapplying every two hours, putting on sun protective clothing including hats, staying in the shade, and not tanning or burning are so important for your skin's health. Be on the lookout for spots that don't heal, new spots, or old ones that change. There are three main types of skin cancer: basal cell carcinoma (BCC), squamous cell carcinoma (SCC), and melanoma. BCCs and SCCs are directly caused by sun exposure and generally, do not spread beyond the affected skin. Melanoma is caused both by sun exposure as well as genetics. If melanoma is caught early, it is curable. Do yourself a favor and have your skin examined by a dermatologist. Encourage your friends and family to do the same. And please, please, don't use tanning beds. According to the Skin Cancer Foundation, indoor UV tanners are 74% more likely to develop melanoma, the deadliest form of skin cancer, than those who have never tanned indoors. That's a big increase. And believe it or not, there are still plenty of people out there using tanning beds, despite all the info about how dangerous they are. Protect your and your loved one's skin - this month and every month.